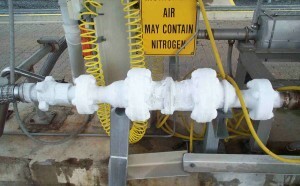 Typically installed for service for Liquid Nitrogen, Liquid Helium, Liquid Oxygen and many more. The Emergency Release Coupling offers a safe identifiable parting point within the transfer system, offering protection to your personnel and equipment. Given the level of growth in this market KLAW has experienced a vast array of supply requirements and each coupling can be tailored to suit your exact product transfer system and operating conditions. With current product sizes available from 1″ to 12″ you can be assured that KLAW will have the transfer solution to suit your application.